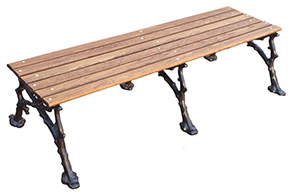 The Woodland Series of park benches add a touch of rustic charm to seating areas, great for historic landscapes, town squares and amusement seating areas-—popular for ski lodges. The creative detailing on the cast aluminum frame gives the bench its character with vintage, woodland themed design. Constructed with top grade commercial materials, the 2', 4', 6' and 8' backless bench seat showcases a choice of White Oak or IPE wood planks.